ho needs a watch anymore? No one truly “needs” a watch due to our phones. However, distractions are common with them. Sometimes we just need something that gives a time and maybe the day we’re on. Nothing flashy is needed either. 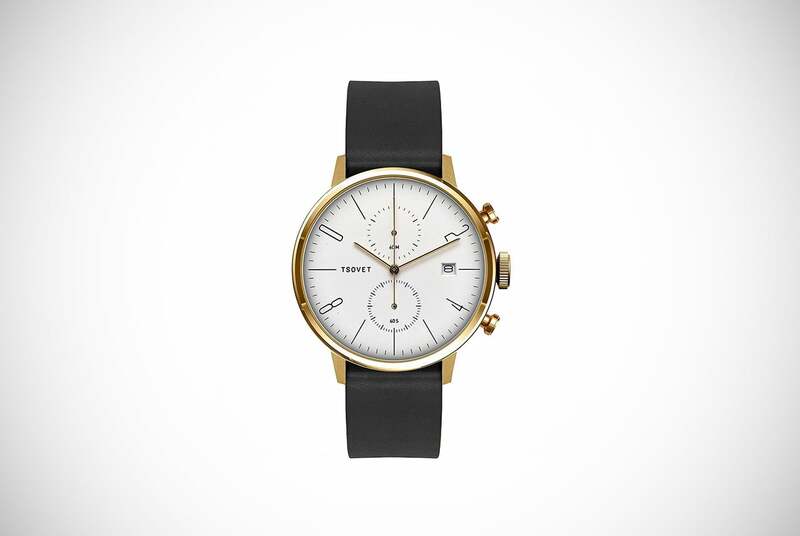 In fact, minimalist watches for men exist for a good reason. While watches may not be necessary as they once were, it doesn’t mean that they’re any less useful. However, it’s not just about using them to tell the time. Watches have proved to be excellent additions to any kind of outfit. If you’ve stood in front of the mirror looking good, but still incomplete, maybe a watch is what you’ve needed along. It’s not just any kind of watch that is sure to transform your appearance though. Currently, it’s all about the minimalist watches for men we referred to earlier. What’s a minimalist watch? It’s a watch that does away with all the distracting extras that make them garish and bulky. Instead, it relies purely on its’s style to look good and complete even the most simple of outfits. Stop wasting your time and check out our list of the top 24 minimalist watches for men on the market today. Your new style is just waiting to be discovered. Greyhours Vision is tremendous at making minimalist watches for men, and have been for a while now. This is a marvelously stylish watch that doesn’t feel like it’s trying too hard, nor as if the designers just said ‘Eh, that’ll do.’ Instead, it manages that perfect balance between stylish and casual, which makes it ideal for all kinds of situations. The anti-reflection technology is definitely something to catch your attention. Meanwhile, its copper PVD shield protects it from scratches and wear, keeping it looking as good as the first day you took it out of the box. With a unique number for every watch found on the back of the case, you know you’re buying an authentic product. 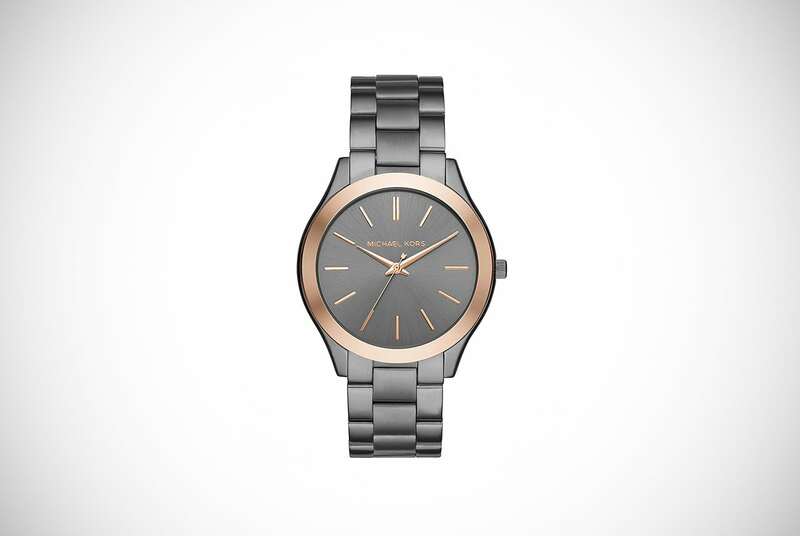 Sophisticated and beautifully minimalist is this watch. The hours may be grey, but you’ll feel like you’re swimming in vivid technicolor with this strapped proudly around your wrist. 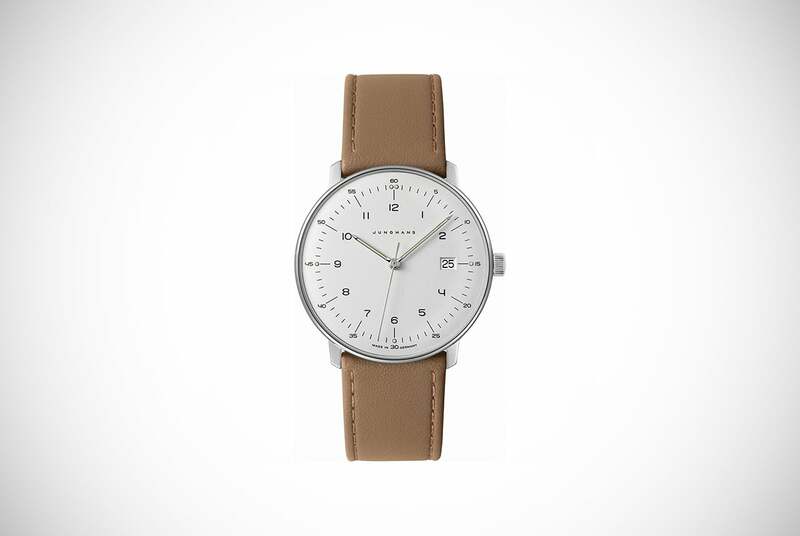 Accompanied by a sleek camel-colored strap, Junghans Max Bill Dress Watch is the perfect partner to casual dinner parties. It is likely the perfectly complement a tan suit and plaid shirt combo. You can wear it to the office or just around the house and never feel like it’s too much. While the markers around the face might make it less minimalistic than you’d like, it’s simple, neutral colors truly help it stand out. 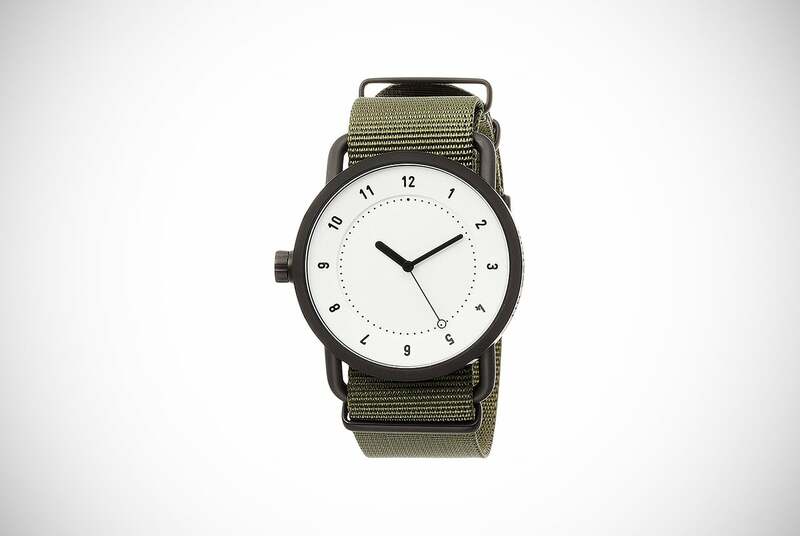 Making these minimalist watches for men look more than minimal at times. You could even come to love these markers as they’ll make your life so much easier. It’s a bit pricey, however. For true lovers of these watches, that may not be a problem. 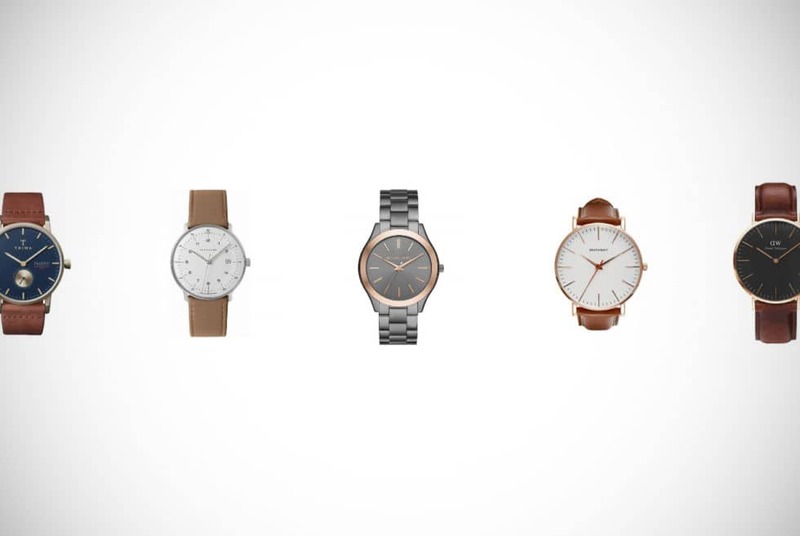 Suitable for any kind of occasion, these minimalist watches for men are both sleek and lightweight. Meanwhile, it’s also completely practical and durable. Its design might conjure up images of evil intergalactic empires. However, we assure you that you will not succumb to the Darkside with this around your wrist. You cannot go there, for you’re our only hope! Okay, we managed to get carried away there. However, going to the Darkside may not be possible here. In fact, it’ll be quite the opposite. 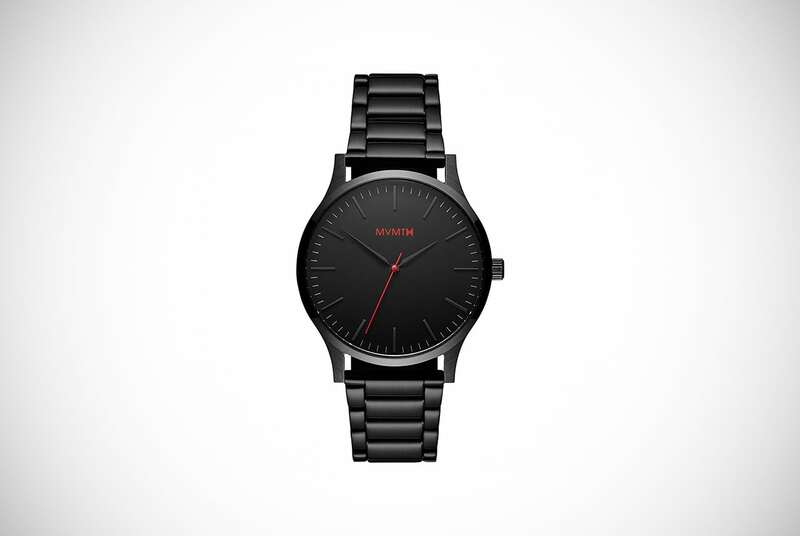 Though part of the MVMT 40 series, it’s officially known as the “Black Link” by the MVMT brand. Its simple construction removes and issues that might come with more complicated watches, and it proves comfortable for all kinds of wrist size. Boasting a reserved face design, it’s simple enough to read in daylight, but you might struggle when the sun goes down. A feature this does have is that the red can somewhat light up later on. Seeing may still be an issue but not as much. Almost light a lightsaber or something. Alright, we’ll stop now. 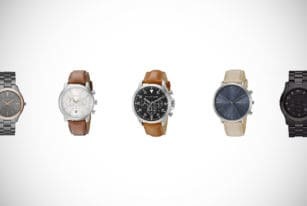 Bringing a classic style into the 21st century, these minimalist watches for men are the ideal way to bring that perfect touch of class to your everyday outfit. Coming at an extremely reasonable price, it’s backed by incredibly fair and reliable construction. When it comes to minimal old-school classic look, the kind of stuff you’d see in Red Dead Redemption 2, few other watches on this list or any other can compare. Braithwait pride themselves on the transparency of their designs. It pushes them to update you on anything you need to know about your watch before and sometimes even after purchase. You’re never kept in the dark. This inspires a level of trust rarely seen with other brands and will make you a customer for life. While its face isn’t strictly minimalist, it’s close enough for our liking. Sold with what might be the only tweed wristband in the world, the Classic Stirling watch is certain to be a conversation starter. Minimalist watches for men often are, because, despite their minimal ideology, they’re good looking. This, funny enough, takes away from the gaudy types of watches that catch all the attention. Yet it manages to catch the eye despite this. With this model, it’s the same thing. You could be waiting in line at the bank or entertaining kings from around the world, it just doesn’t matter. Rossling & Co. have designed a wonderfully modest yet stylish watch which would look excellent on anybody’s wrist. The large face is easy to read without feeling too big and doesn’t feel busy at all. Meanwhile, the hands are installed with a popping blue that adds that little bit of uniqueness that you don’t get with standard watches. The crown is easy to use, and the single subdial is the perfect addition to an excellent timepiece. 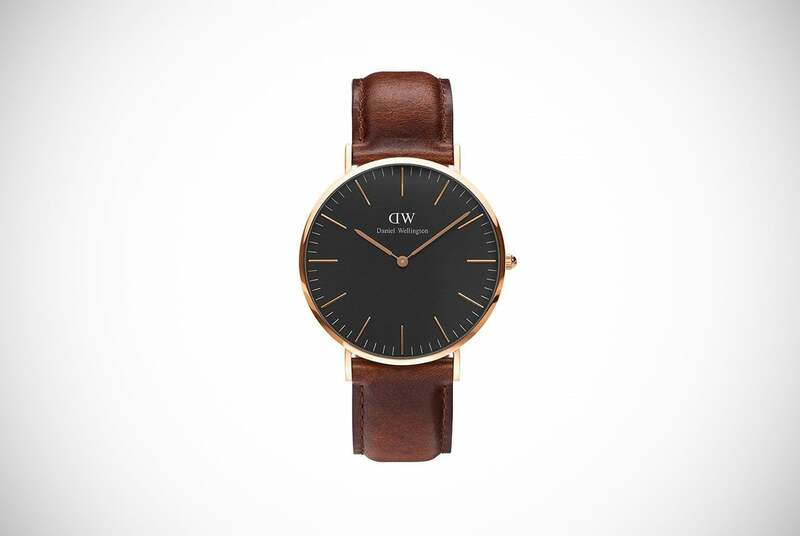 Daniel Wellington has brought you these wonderful minimalist watches for men that could be the envy of all other watches on the market. With a smart leather strap and a dark face, you get something a little different than your standard neutral colors. This if nothing else should make you take notice of this watch before anything. It’s much more than merely a face and strap though. The casing is crafted with a sophisticated rose-gold that won’t threaten your sexuality but instead adds to your manliness. This gives it a headstart over other watches and means it can be mixed and matched with a number of outfits. Regardless if it’s from your most formal to your most casual look, this watch seems capable of working for you. It’s scratch resistant as well. While you should still take care of it, you won’t find it ruined the first time you get complacent. Did you know Tid is Swedish for time? No? We didn’t either until like, maybe twenty minutes ago. It makes sense though, and this TID NO. 1 watch has time in abundance all while presenting a hugely stylish timepiece. It manages to be both stylish and formal at the same time. In that, you can literally wear them with anything and they’ll be perfect. 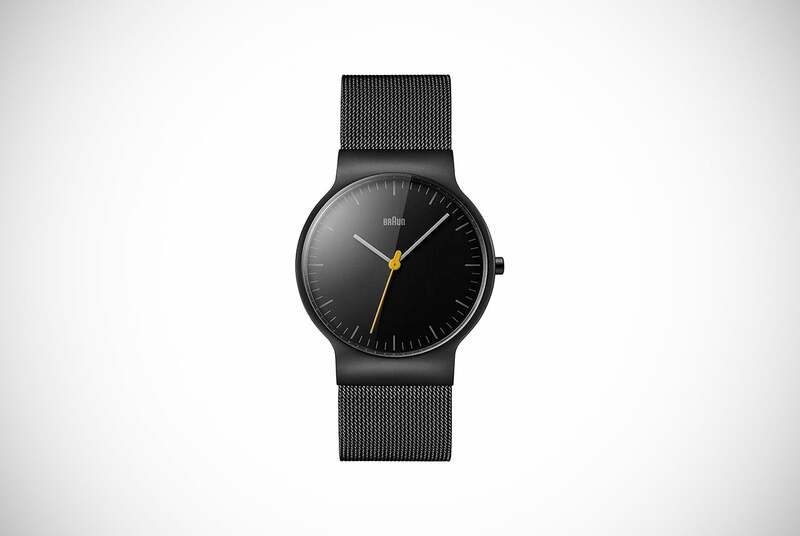 You can see this in action perfectly with the TID NO.1 minimalist watches for men. Giving you exactly what you need and not a thing more, the face is easy to read and comes with a cool hooked second hand for that little bit of uniqueness. Meanwhile, the nylon strap is comfortable on the wrist and harkens back to an older time when we were younger. Several watches were like this as kids because of the rugged nature boys found themselves in. That just means this strap is tougher than your average types. With a breathable strap that protects the material as well as your wrist from itching and dampness, the Fairfield Chronograph is a watch is tremendous. 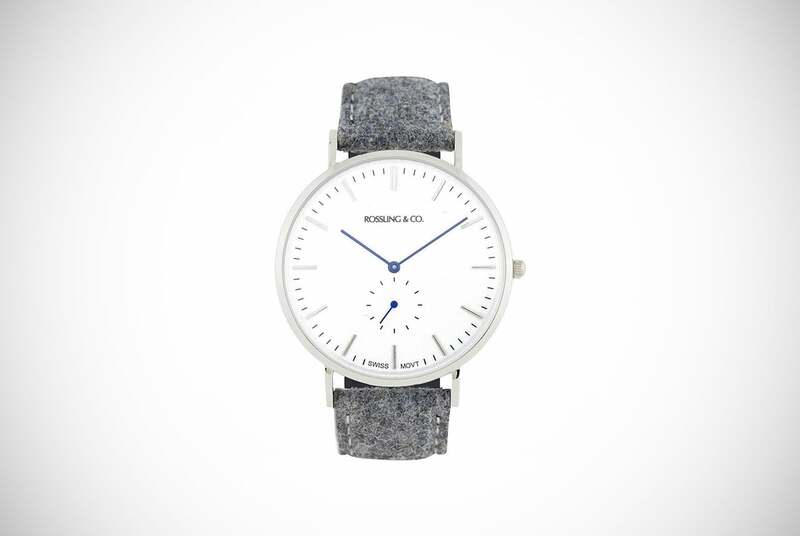 These minimalist watches for men possess as much functionality as it does style. With three crowns, you have the maximum amount of control over how well the watch runs. This saves you time in clicking between functions that you might find in other watches. It also comes with a date window as well as Indiglo capabilities, meaning you can read it in the dark without having to strain your eyes. 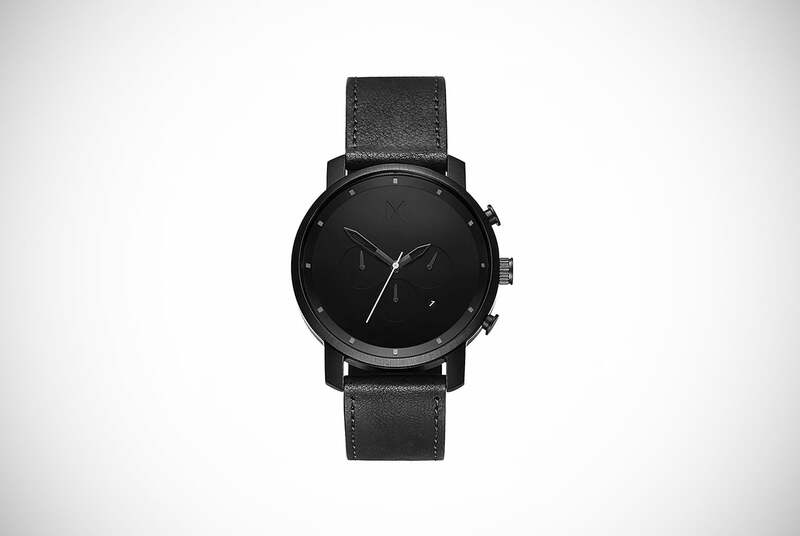 Our second MVMT watch on the list keeps with the darkened theme that sets MVMT apart from other brands. Meanwhile, this still achieves an excellent minimalist design. Relying on small indicators for markers, it’s almost as if the watch face is entirely black. Well, that’s until you look just a little closer. The minute and hour hands are barely visible against the face, but this is a good thing. It keeps the design in line with exactly what minimalism is supposed to be. The second hand is white and stands out against everything else, giving you some frame of reference. Meanwhile, the black leather strap is both smart and genuine, giving you a watch that you can wear anytime you want. 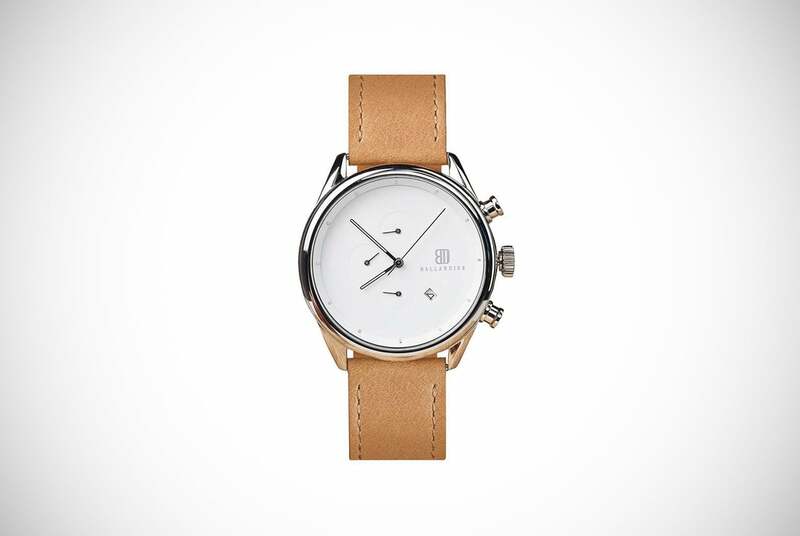 Truly genius minimalist watches for men these are. Something we’ve come to expect from MVMT at this point. 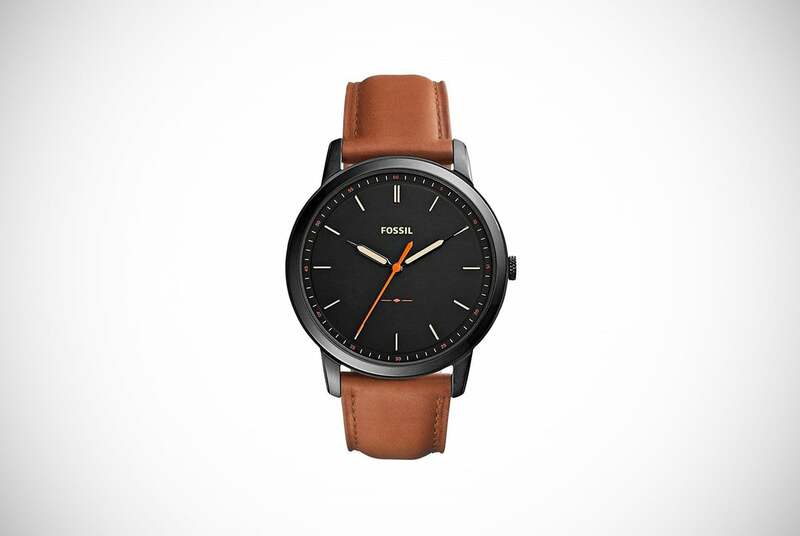 Fossil’s The Minimalist is exactly what it says on the label and combines both casual appearances with formal suitability. This just goes on to maximize its potential as a watch for all occasions. The black watch face gives it an understated look. Meanwhile, the brown leather strap adds a feeling of familiarity with the design while also being highly durable for long-lasting wear for years to come. It’s comfortable to wear throughout the day, and the sharp orange seconds hand stands out vividly in an ocean of darkness. The face is reasonably-sized, making it a simple read at a glance. Unlike other analog watches, it’s extremely quiet, so you won’t be distracted with an irritating tick, tick, tick as you’re trying to go through your day. Minimalist watches for men that also don’t force us to hear constant ticking? We’re fans! 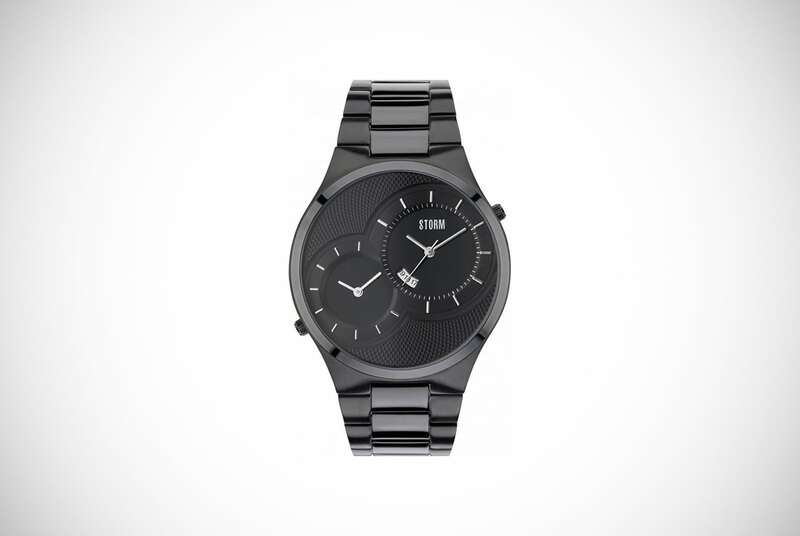 This Braun watch combines brains and sheer modern style to create a timepiece that is sure to suit your outfit. Regardless of where you’re heading, whether it be to the office or chilling with buddies. Its metal chain-link strap conjures up images of battling black knights, while the face represents the perfect shield against fashion faux-pas that can be easily avoided. Entirely numberless, the face is perfectly minimalist in its design, possessing neither too much or too little. Meanwhile, the markers and hands are still easy enough to read during the day. The only problem you might encounter is the lack of backlight. This makes nightly time telling a little more complicated, but it truly looks fantastic despite this. 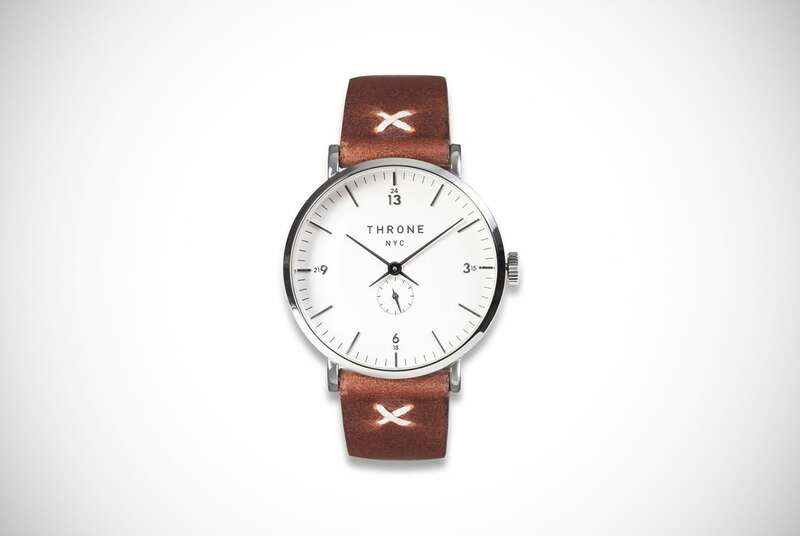 A superbly Kingly watch fit for absolute royalty, the Throne Masses 1.0 is a very unique watch that combines classic vintage and modern designs. All to craft a timepiece that should be embraced by anyone who cares about watches. Completely tearing up the rulebook and starting anew, the Throne does away with that boring old 12-marker and replaces it with a unique 13. Each individual number (3, 6, and 9) are fitted with raised profiles that add touches of style in a way that makes you wish all watches looked like this. If that were true though, there’d not be as much special about this one, and that’s why we love it so much. Minimalist watches for men need to be unique in order to stand out. As their nature is seemingly to not do so. The Throne Masses 1.0 does exactly that while keeping to its minimalist design. Designed with a low-profile and subtlety in mind, the Ted Baker Samuel watch is a casual piece to add to our list. However, that shouldn’t throw you off. It comes complete with enough sophistication to be acceptable for more formal events should you need it to. This is achieved through a smart gold casing that is classic in style. It’s truly hard to beat when looking for universal design. 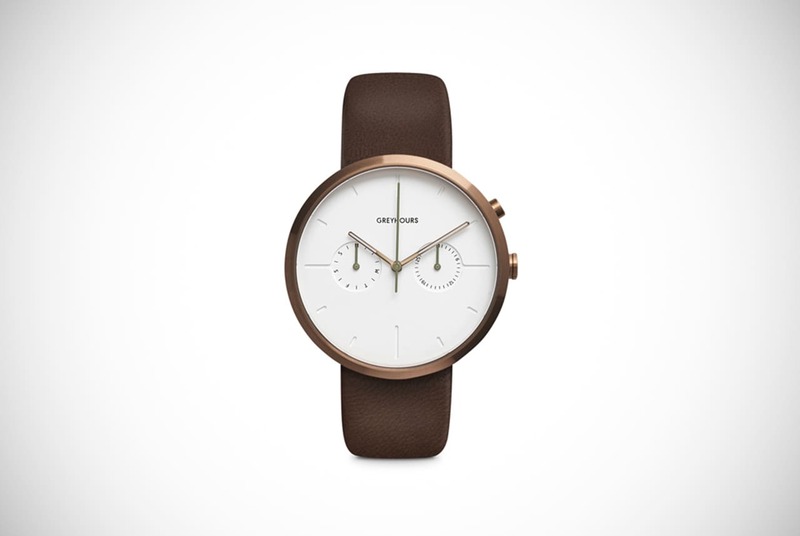 Nothing may seem special about this design, which is what’s so great about minimalist watches for men. They are not supposed to be overly gaudy, feature-filled, and special. However, Ted Baker doesn’t deal with lesser than. They made this watch a perfect fit for nearly any occasion, something that is hard to do with any watch. It’s also water resistant of up to 50 meters, very impressive for any watch. If that wasn’t enough, they offer a two-year guarantee on the model. We’re not even done on its design either. The watch face is a clever mix of white, black, and red, which is easy on the eyes and doesn’t distract from anything else. The strap is made from silicone, which might turn up the noses of some watch purists. However, if it’s a casual affair you’re after then that substance is relatively universal. As is gold, just ask Goldmember. The first thing you’ll notice about the Tsovet Analog watch is its unique numbering design which certainly helps it catch the eye of even the most watch-neutral person. Going against the grain of what’s expected in a watch face, and it is something we expect watchmakers to do from time to time. This abandons your traditional 3, 6, 9, 12 numbering system and instead highlight 2, 4, 8, and 10. Any reason? Truly the only reason seems to be that they wanted to create something newer while using a classic model. Other than this, the rest of the watch is like what you’d expect from a watch that screams class at a glance. The gold casing is sleek, which makes it excellent for casual occasions. While the wristband could be better made, it’s certainly enough to withstand wear every now and again. If you don’t like the strap, you can always replace it too. Making it a very useful watch to have around. It lives up to the minimalist watches for men category we had it in, that is for sure. The Komono Winston Pewter Quartz Dial is super stylish and super unique, with a marble-esque watch face and canted-angle design. It’s a watch that understands how gold can impact design for the better. In this case, the thin markers offer an excellent respite from an otherwise dark overall color. All of this without going over the top. The design is only the beginning though. What really stands out about these minimalist watches for men truly is the price. You’d never expect it from looking at it, but it comes at a marvelously cheap cost. If you need a watch for next to nothing, yet is still amazing looking and incredibly functional, then look no further. Champion by name, champion by nature. That is the Ballardier Precision Champion watch in a nutshell. 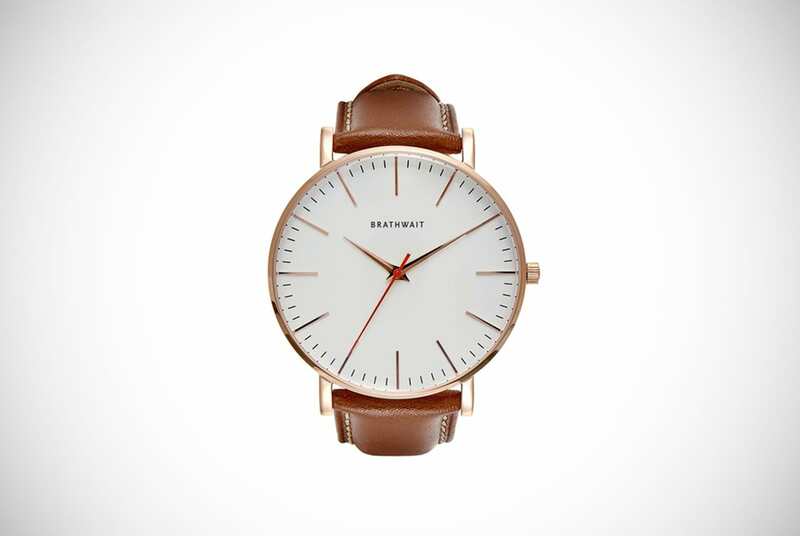 These minimalist watches for men come with a genuine leather strap that can be changed at will. This comes on top of three incredibly low-profile and minimalist subdials which take the watch from good to great. The white face is almost glowing in its purity, while the hands are thin enough not to distract from the rest of the design. As for the strap and casing (complete with three adjusting crowns), you’ll have something that is fit for any event and will match with any kind of outfit you choose. It achieves both a professional and casual look with ease, leaving it entirely up to you when you next want to show it off. What do you mean you don’t know how automatic watches are all the rage? Well, dude, let us lay some knowledge on you. Not only are they just simply super cool, but they’re also better for the environment. To top it off, you won’t run out of battery. If you get your hands on any automatic minimalist watches for men, you can be sure to reap the benefits for decades yet. While automatic anything seems less than minimal or classic to some, it seems Namos Orion figured it out. The watch has been designed with smart and neutral colors, combining cream and silver elegantly that will perfectly suit your summer wardrobe. Meanwhile, it also has enough class to look great over the winter. One slight drawback for many might be the price – it certainly doesn’t come cheap. Just imagine what you’ll save on batteries though! As the English would say Kor(s) blimey, what a superb looking watch, and they wouldn’t be wrong. These tremendous yet minimalist watches for men come with high-quality construction. Something we expect from the Michael Kors brand these days. They’re also incredibly lightweight so you can wear it all day long without feeling weighed down by a fashion accessory. A simple design that’s no less great to look at, you’ll be able to rock this either at work or at play and never feel under or overdressed. The metal wristband makes it incredibly durable and able to withstand years of wear. It’s also water resistant up to 50 meters, meaning you can enjoy at least some fun splashing around in the surf if you forget to take it off. Of course, you could just really want that watch tan line, but you do you, bro. Despite the fact that DUODEX sounds a little too similar to a Pokemon you might have cursed in your youth, Storm London has created a timepiece that deserves only your adulation. It also doesn’t come with threats of throwing the Game Boy against the wall. We know your landlord or wife will thank you for not doing that. Weighing just 111 grams, you’ll hardly feel like it’s on your wrist. 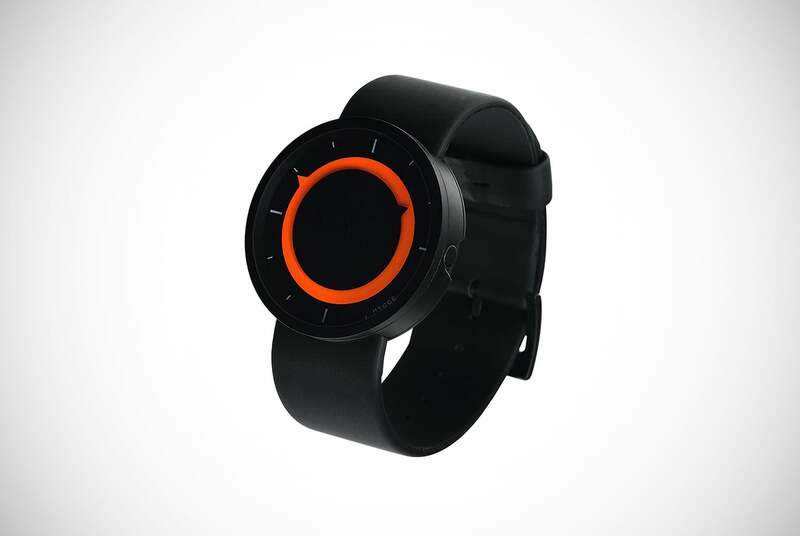 This is only further backed up by a sleek design that makes it look more like a spy gadget than a watch. What’s also cool is that you can set two time zones, so you can keep an eye on what time the soccer kicks off across the pond. Of course, this just shows off your international knowledge. Whatever your reasons, the DUODEX has you covered. This Atticus watch from Huckleberry & Co. comes with an off-white dial that would make Patrick Bateman quiver at his desk in rage. 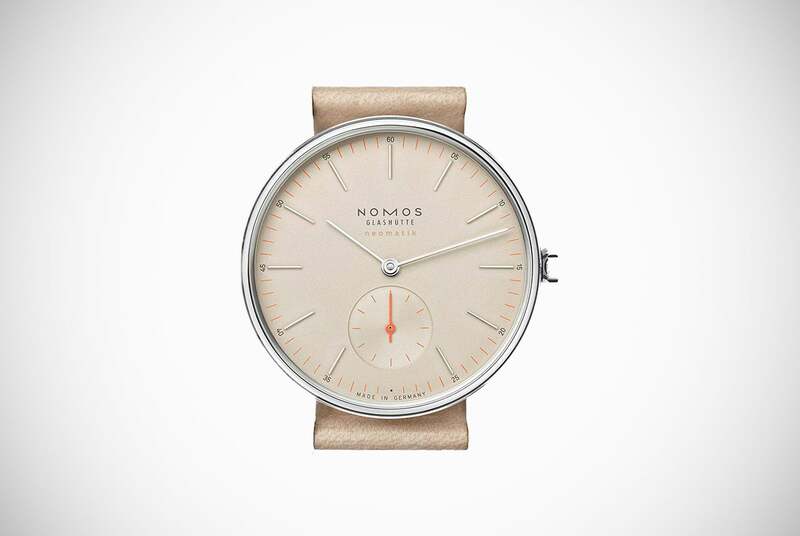 You don’t have to be a genius or “psycho” to see the great job that was done with these minimalist watches for men. So sleek, so stylish, so sophisticated, it’s been designed to suit any shirt and tie combo. Simply, it can go with any number of other attires no matter the event. Constructed with automatic winding, you’ll never run out of battery, ensuring that those ‘Sorry I’m late’ excuses become a thing of the past. The strap is polished leather that fits comfortably around the wrist. Unfortunately, it’s so popular that at times it may be sold out from certain online retailers. However, if you really want to get it around your wrist you shouldn’t have to wait too long for it be back in stock. They make a lot of them and for good reason. If you’re looking for cheap minimalist watches for men then the Ted Baker David Watch might just be the one for you. You’d never be able to tell the difference between this and some of the more expensive brands, however. With great color combinations, excellent construction, and overall smart fit, it manages to stand out as much as an expensive type. 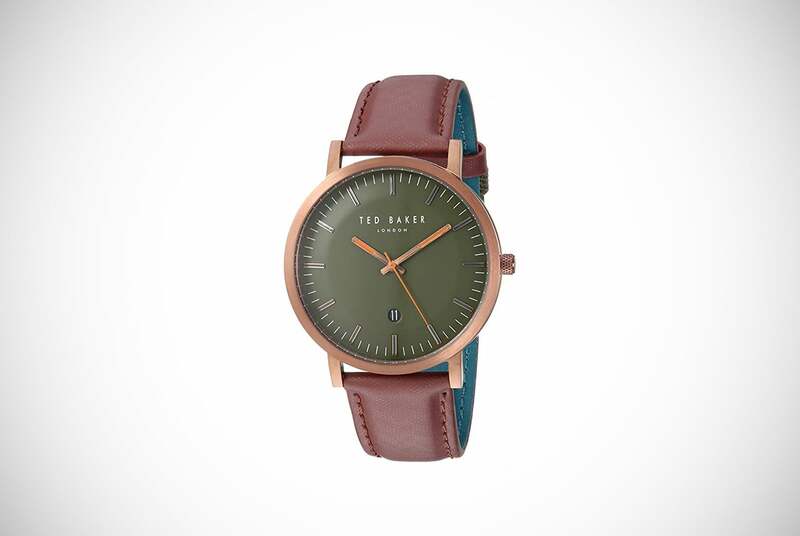 As a Ted Baker watch, you know you’re investing in quality. The David watch brings you enough quality for all sorts of events no matter how you’re expected to dress. Despite this, the wristband can be a bit uncomfortable, so maybe only save it for special occasions. However, if you’d like to get another then it’s incredibly easy to order another Ted Baker strap for it too. Named after the Swedish bird of prey, you will feel like the top of the food chain with this smart and cool piece strapped around your wrist. Triwa chose to indulge in the magic of color combinations instead of tried and tested methods. This is normally a dangerous move to make. 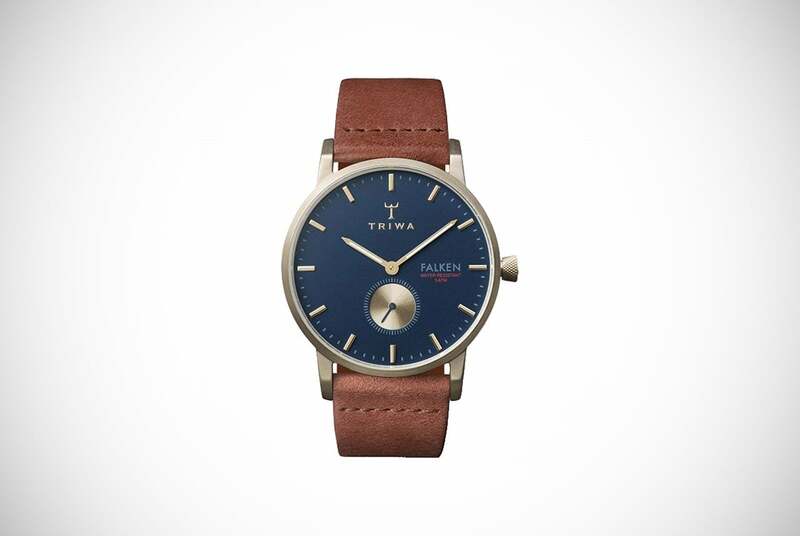 Yet these minimalist watches for men by Triwa pulled it off with ease. Their Loch Falken watch is a great casual timepiece that keeps on giving. Inside the face, the mini-dial adds to a simple and elegant design. 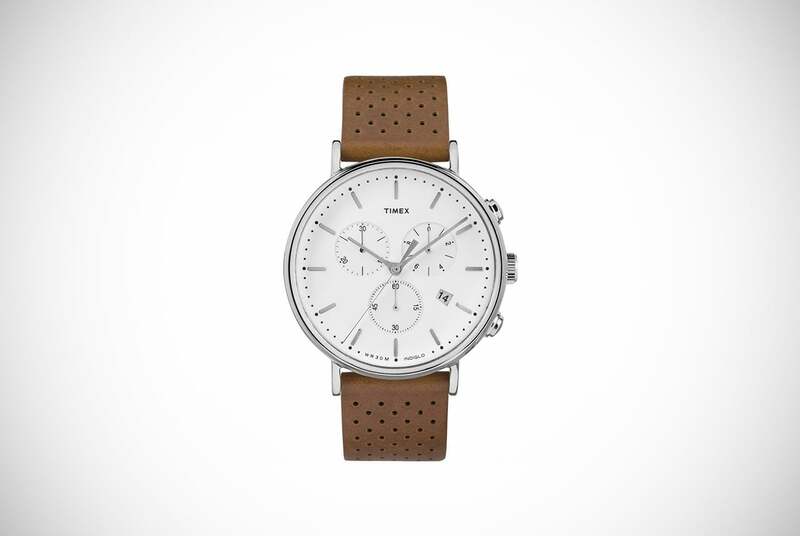 The organic leather band brings a touch of unparalleled class to the timepiece. That is like the cherry on top of a nice pie or cake, but it is neither. That said, let’s just call it the tick that drives the tock. 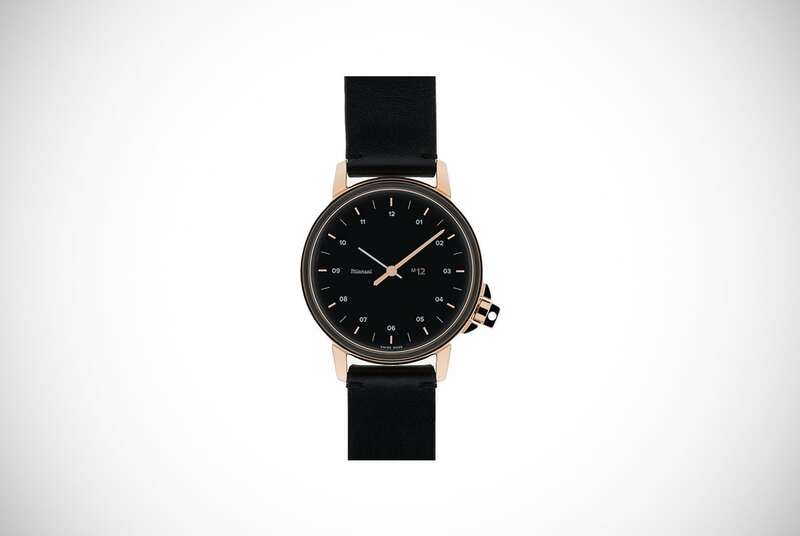 This HYGGE black minimalist watches for men might just be the coolest timepiece in our Buyer’s Guide. One glance at its design will convince you of this. It’s surely something you’ve never seen before, which makes it exciting alone to check out. It both stands out, yet stays modest no matter where you want to show it off. It’s not just style over substance, however. There’s also the matter of comfort and functionality. Luckily, the HYGGE has that in handfuls. It’s easy on the wrist and, eventually, easy to read. Very stylish, and very minimalist, making it perfect for several occasions. There’s sure to be a lot of people asking you about this watch, and who can blame them, right? Our final product boast heaps of class and refinement time after time. Its genuine cowhide strap gives it that vintage feel, while the face is a great combination of sophistication and innovation. This is too often overlooked in other kinds of watches. 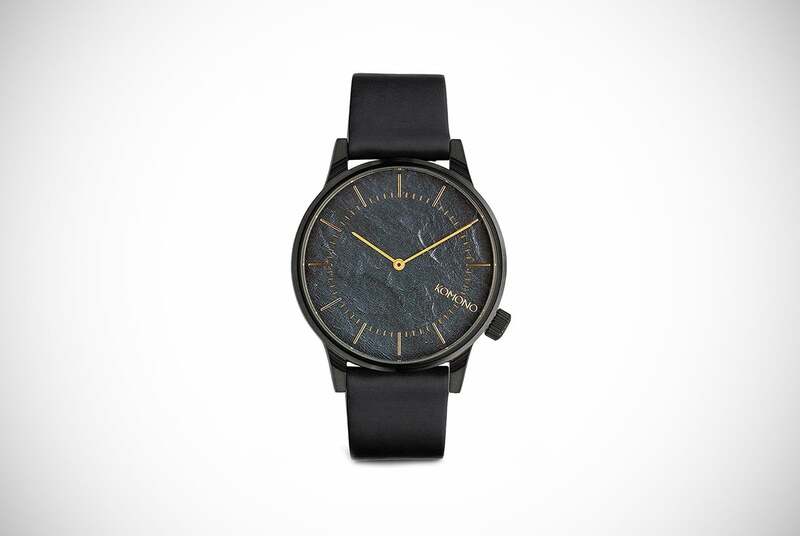 However, you won’t be able to do so with these minimalist watches for men by Miansai. The numbers are small, but still readable, which give it a fine balance between functionality and design. The hands are smart and easy to view against the face, while the jagged crown placement adds a touch of uniqueness to the watch. Sophisticated and stylish with enough personality of its own, it’s a quality little watch that would look ideal on your wrist. Is it harder to tell the time when wearing a minimalist watch? While you might think that minimalist watches for men make it harder to tell the time, you don’t have anything to worry about. If you’re first making the leap from digital or numbered watch faces (though some are digital), then there’s a learning curve. You’ll have to go back to that grade school or elementary school education that taught you how to tell time from a normal clock. We know, gasp! The human brain is weird, though. You get used to seeing something and this creates a memory that is easy to access whenever you need it. 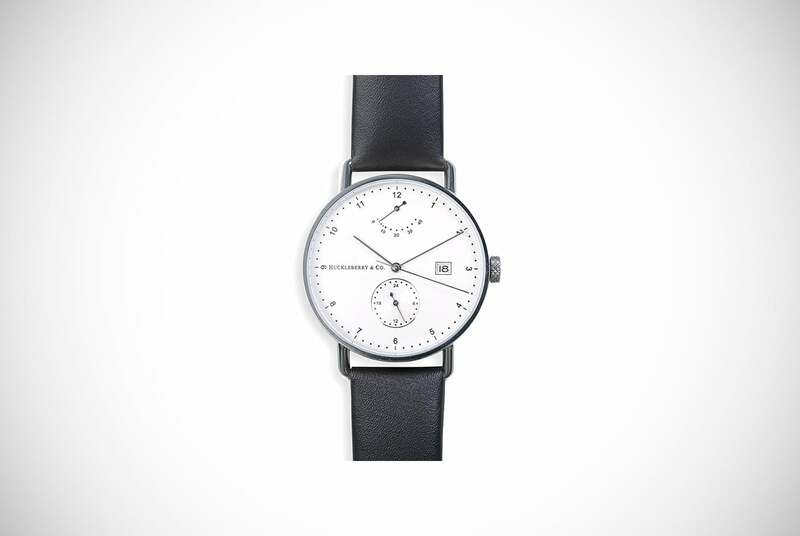 Minimalist watches for men take you back to almost square one. You’re used to seeing numbers surrounding the face, and suddenly they’re gone. Time remains the same, you’ve just got to figure out where certain numbers go. It isn’t hard, just remember the 12 is at the top. However, there are some minimalist watches for men designed to turn this on its head. These abandon the traditional use of hands on the watch face and instead go for things such as ball bearings or arrows. It might take time to get used to, but you’ll have a cool watch in the end. If you want to make the most out of the watch, it’s not too much of a challenge to tell the time using them, you’ll just need to get used to it. Many can cost a good chunk of change to purchase, so you’ll want to get the most out of any you buy. Learning how to tell time from it is crucial to that. We promise it won’t be very difficult. Do minimalist watches for men go with most clothes? You’re totally fine. The beauty of minimalist watches for men is that they’re understated and reserved design means they can suit pretty much any outfit. Unless you’re one of those weird people who like to buy clothes for every occasion or thing, then that’s your journey, pal. The style of the minimalist watches that men wear can actually do a lot more for your outfit than you might expect. They have a fine balance between both business and casual. This allows you to achieve a number of cool, unique, and sophisticated modern looks that would be almost impossible with a traditional watch. By mixing and matching with a suit or something that’d be considered more casual, you can open a whole new world of attire possibilities all with just a simple watch accessory. This means that the watch can be worn to the office, to weddings, formal dinners, and even rocked when you’re just kicking back with your buddies after a stressful week. Furthermore, minimalist watches for men come in a variety of cool and unique designs. We’re sure you’ll be flooded with compliments from friends and strangers alike, perfect for the type who likes nothing more than being the center of attention. We get that even the manliest of all men can have a look at their wardrobe and think ‘Man, I could really do with some new clothes.’ It’s the 21st century, after all. However, don’t spend your upcoming paycheck on a complete makeover and irritate the wife as a result. Simply take advantage of the myriad of possibilities minimalist watches for men can provide and rock it with both style and confidence. What are the main things to consider when buying a minimalist watch? There is a lot to consider before buying any watch, especially before buying minimalist watches for men. The reason for this is pretty obvious. Watches are often a fashion choice as much as they’re used to tell time. This means you have to consider what you normally wear and how things will go with that style you’re rocking. The biggest thing is the economic situation you’re in. If you’re like us, you cannot afford to buy dozens of watches on a regular basis. One or two at a time, and then maybe more later on, right? That means any watch or watches you buy need to go with that style as you’ll only have a small number of them for the time being. However, there is much more to consider than this. In that knowledge, we put together a few things you’ll want to keep in mind before buying minimalist watches for men. If you’re ordering online it can be a bit of a challenge to work out the proper fit and whether not it’s comfortable enough. If you can, try checking out the watch in the store. You can even take advantage of some “try before you buy” services so you can be sure this is the watch for you. However, another really easy and common thing to do would be to simply measure your wrist. If your arm is a certain width/length, then a watch you buy needs to go with that. You also want something that can have a little slack to it. This is needed so that you can easily take it on and off and do not mess with any blood flow to your hand. Trust us, you don’t want to see the issues of the latter. There’s not really such a thing as minimalist watch brands. Instead, we have brands that create minimalist watches for men. 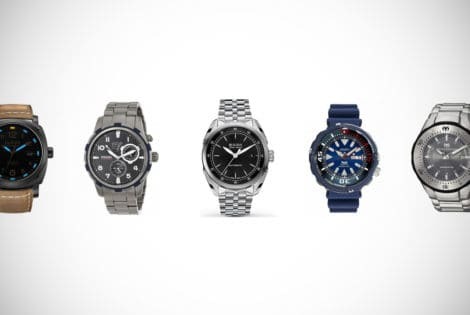 Some of these will be famous watch brands you’ve always heard of and some will be new to you. That doesn’t mean their products aren’t worth paying attention to, however. There are a ton of amazing new brands in fashion each year, as well as new tech companies that rise up. If we ignored them, do you think Men’s Gear would ever survive? Never. Though we’re not sure if that weird fruit company will ever last in the tech field. In any case, if you like a design we’d rather you go with what you like. The brands matter, however, for a few reasons. They tend to be guaranteed as better products than others. However, the biggest thing they offer is a warranty or “insurance” as we like to call it. Watches are damaged on the regular, so having a place with a warranty behind it can be crucial. Especially after spending a ton on buying one. The type of strap you have can affect how much you wear the watch and what kind of events it is appropriate for. Nylon or fabric straps are more suitable for casual occasions. Meanwhile, mesh-metal or leather are considered appropriate for formal and professional environments. Basically, it might be more of a fashion thing than anything else. However, this is important for people who have allergies to be aware of. Some people are allergic to nickel or even leather. There are several products that keep you in mind, so look for products that will give you information on their straps. Often times, special-made straps can be created by top brands just for people who need them like this. Do you want lots of numbers? How about just a few? Do you want a face completely devoid of numbers and any other designs? The face style will depend on what you consider truly minimalist. Looking at some of the watch types on this list, even watchmakers aren’t entirely sure what that means. However, this is all on what you prefer. Truly, any watch it in the end if we’re being honest. Simply buy the type you like with the face you can read the best. Especially in the dark as well as light conditions. 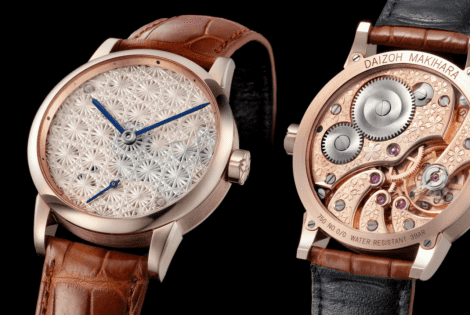 Minimalist watches for men will come with a different kind of construction than your average watch. There will be fewer bells and whistles, of course. Instead, it’ll rely more on an understated and modest design that wants to catch your eye, or not. That’s kind of the point. It’s supposed to be minimal, of course. That doesn’t have to mean it cannot look good. The construction of the watch also has a lot to do with how it’s made or “built” if you will. The way the inner-workings are done, the type of watch it is, all of this. Simply research into this if you’re serious about buying a watch. You could, of course, keep reading our guide too. We’re pretty good about explaining that stuff. How often will you wear it? Where can you wear it? These are questions that must be asked before clicking Confirm Order and can affect whether or not this was a worthy purchase. This also harkens back to what we referred to above. What you can wear it with is incredibly important to remember. You’ll also want to be aware of the places you normally go. Do you need to pay for a high-end minimalist watch at the office? Sure. However, if you’re a football coach then it may not be the greatest idea to consider wearing one all the time. If you do, at least not at practice or during games. Ya know, to avoid breaking it. Either that or simply getting several cheaper versions. It always comes down to the price, right? We know you’ve reached that stage in life where you can afford to splurge every now and again. However, if everyone did that as frequently as they were impulsed to, well, things would go very south very quickly. While it’s nice to treat yourself every now and again, try not to buy a watch using your whole life savings. Some watches can get very expensive. As we also referred to above, it’s cool to buy stuff in moderation even if you can afford to buy many. You still have bills and you’re also wanting to buy that trip to Hawaii you promised the wife and she NEVER lets you live down a lie, Carl! Investing in any of the minimalist watches for men on our list will be great for anyone. Especially women trying to buy their man a Christmas or Birthday gift. These watches might just be the answer to all of your dull outfit woes as a man. The beauty of minimalist watches for men is how it can go with pretty much anything you throw on. Going to a party? Minimalist watch. Want to impress at an interview? Minimalist watch. Want to look good at your wedding but not upstage anybody? Minimalist watch, minimalist watch, minimalist watch. In case you’ve not yet got the picture, adding a minimalist watch to your collection is something you should truly do. There are some periods of time where your everyday timepiece just won’t cut it. Of course, you already know what the answer to that problem is, don’t you? Stop wasting your time, and stop missing out on all the potential that these watches can provide. Slap that stylish and sophisticated little strap around your wrist, but be quick, the time is already ticking away. Men, looking for a sweet and classy piece to wear on your arm but not sure what to buy? Check out this guide to the hottest Michael Kors watches gift your wrist something special. G-Shock watches are stylish and high performing, we know that already. But this new model from their stellar lineup is a bit different. They have added to the expected stylish features and reliability with some brute ruggedness. This watch is wearing Ray-Ban shades alike its brothers but has turned up to the party with an envious beard and a couple of new tattoos. 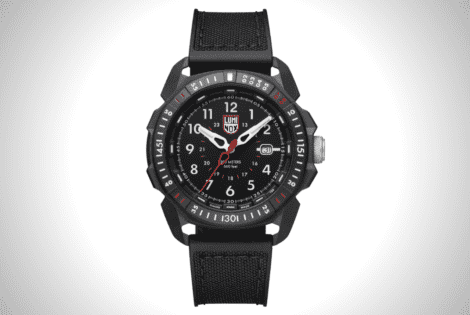 Luminox is no stranger when it comes to rugged wristwatches. 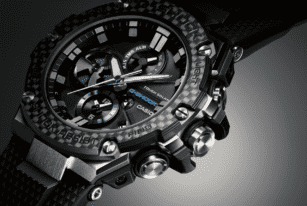 Yet, this new model, called the Luminox ICE-SAR Arctic, meets another level of durability. 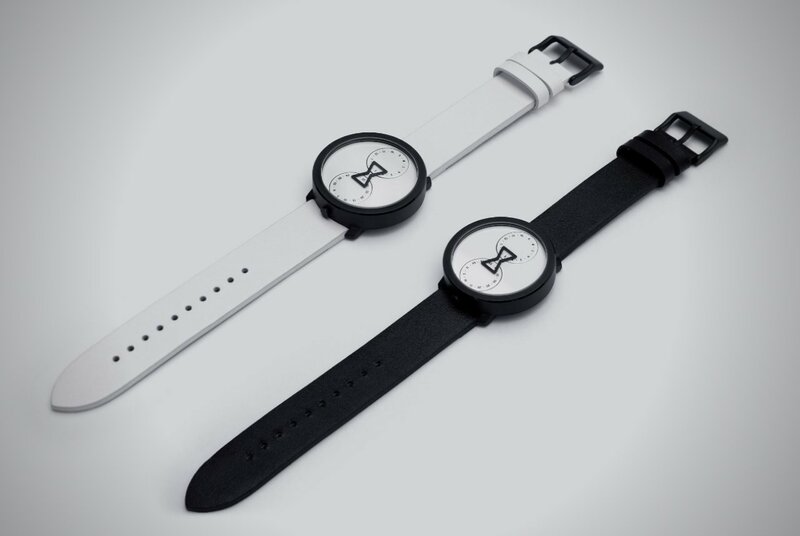 Some good apples still emerge out of the cruft of Kickstarter projects, and we hope this one, called the NU:RO Watch, is one of them. Considering that it can take as much as 8 months to build each to completion, it is not surprising that only 8 in total will be available to buy. The laborious and intricate work involved, plus this timeframe also goes a long way to explaining the high ticket price.